China has stepped up its business presence in Africa, but is being criticised for not pushing for improvements in human rights and governance in some countries. There has never been a better time to buy flip flops in Dar es Salaam. At the Kariokoo street market they come in all shapes and sizes: wedge heels, sequins, buckles. Flip flops for work, and for fashion. But at Tanzania's only flip-flop factory, these are dog days. All but a few varieties of Africa's flip flops now come from China and local companies cannot compete. Mr Ghaddar claims end of line stock from Chinese factories is "dumped" here, sold for less than the cost of materials, dodging customs and import duties. Some Tanzanians object that Chinese imports are shipped to the Chinese embassy in diplomatic containers from Beijing - but no-one can prove it. Outside, Chinese digger trucks are at work in the street - a Chinese company has won a government tender to renovate the sewage system. And foundations have been laid for the new Julius Nyerere National Stadium, named after Tanzania's founding president. The raw materials, machines, the pipe work and the scaffolding, come from Beijing. 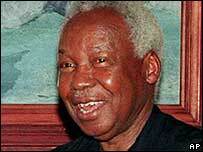 Julius Nyerere visited Beijing 13 times - a record for an African leader. What he saw in China inspired "ujamaa", the policy of self-reliance and collective farming announced in the Arusha Declaration - Nyerere's audacious statement of African socialism in February 1967. Chairman Mao returned the compliment, sending Chinese engineers to build Tazara - the Tanzania Zambia Railway - to carry exports of Zambian Copper. Many of those Chinese engineers are buried in a neatly tended graveyard, set behind a low white-washed wall on the outskirts of Dar es Salaam. A marble plinth, inscribed with Chinese characters, reads: Cemetery for Memorable Deceased Chinese Experts Assisting Tanzania. An official who visited recently from Beijing claimed Tazara is still a household name in China and more Chinese experts are on their way. Hu Jintao, China's president, has announced a doubling of state aid to Africa: £2.6bn in trade credit and loans, new schools and hospitals, professional training for 15,000 Africans in Beijing. Some Western observers are sceptical. Already, Africa supplies a third of the oil fuelling China's economic boom. Paul Wolfowitz, the American neo-conservative who is now president of the World Bank, says Beijing ignores human rights, corruption and environmental standards. But there is no oil in Tanzania and few of the commodities China craves. East Africa's poorest country is also the donors' favourite. In the past six years, Western aid agencies have spent almost £3bn here - more than Hu Jintao promised over three years for the entire African continent. If that is cheque book diplomacy, China's cheque book does not look big enough. Chinese exports, on the other hand, seem almost limitless and now that China, like Africa, is capitalist, their relationship is more self-interested than sentimental. Not far from the spot where Mr Nyerere made his famous declaration of African socialism, I visited a factory making generic anti-retroviral medicines for people with Aids. 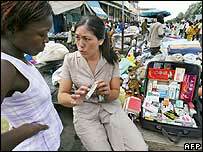 Cheap chemicals from a private company in China enable Tanzania Pharmaceutical Industries to manufacture these life-saving drugs at a cost of US$11.5 (£6) per patient per month. Even a few years ago, that would have been wishful thinking. Back in Dar es Salaam, I meet Yang Lei owner of the Dong Fang Development Company Chinese Shop on Samora Avenue, a busy downtown shopping street. Mr Yang is the 31st member of his family to settle in East Africa. His uncle opened the first of their seven shops in Nairobi, a decade ago. But after three years here, Mr Yang - who wears a sweatshirt with a picture of an American footballer and the logo "Top Class" - has learned neither English nor Swahili. His showroom is draped with silks, curtains and upholstery fabrics and is crammed with furniture such as dining suites, reclining chairs and an emperor-sized bed with adjustable headrest. Mr Yang, his wife and his teenage son sit at the back of the shop munching snacks - Chinese snacks - from a jumbo-sized packet on his desk. 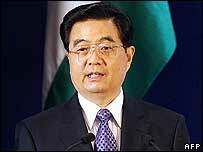 Yes, Mr Yang admits, through his translator, he has heard about local businesses swamped by Chinese imports. Then he shrugs and says: "Africans love my shop." From Our Own Correspondent was broadcast on Saturday 25 November, 2006 at 1130 GMT on BBC Radio 4. Please check the programme schedules for World Service transmission times.